Adopting any new pet is making a lifetime commitment to them so this computer-DVD guide with video, takes you via a step by step approach through what to look for when choosing your new pet rabbit - the size, the breed, where to buy from and what to look for when doing so. Indoor and outdoor housing advice is given along with tips for making your own accommodation, together with feeding advice, how to pick up and handle your rabbit, grooming, bonding multiple rabbits, litter-training and bunny-proofing your home plus an overview of breeding and showing through to healthcare advice including treating medical conditions, syringe-feeding a sick rabbit and details of rabbit vaccinations needed in the UK. 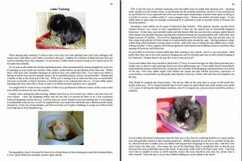 This is a modern, British, up-to-date comprehensive care guide aimed at today's rabbit owner, and covers all aspects of companion pet rabbit care to help you and your rabbit make the most of your lives together and is illustrated throughout with colour photographs. Over 30 videos are included to demonstrate how to choose a healthy rabbit, distinguish between male and female rabbits, pick up and handle your rabbit, groom his coat, help him through a moult, bath him if this becomes necessary, spray his bottom to help prevent fly strike, administer eye drops and even give an injection. Words can describe only so much whereas a video actually shows you what to do - and how to do it. It is aimed at both first-time novice and experienced rabbit owners wanting to learn more. Unlike most other guides which tend to be rather basic or too 'fluffy' and clearly aimed at children, this contains much more detailed and in-depth information making it especially suitable for adults who already own or are planning to adopt their own companion pet rabbit/s. 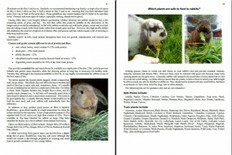 Probably the most detailed and comprehensive pet rabbit care guide available! Order your copy now - with free UK delivery! 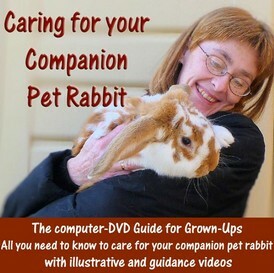 Comprehensive rabbit care and healthcare computer-DVD guide with illustrative and guidance/demonstration videos. All you need to know about caring for your pet rabbit.